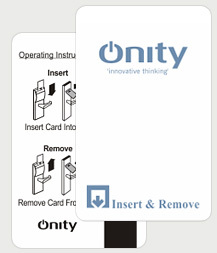 Newline offers a full range of keycards suitable for use on the Onity lock systems. We offer magnetic stripe, in both Hico and Loco options. Custom printing as per the clients design in quantities as small as 500 key cards. HT-RFID Mifare compliant PROX-SR512 system. To ensure that you get the correct product you need to find the lock model with the product code and specify the same to ensure that you get the right kind of RFID contactless smart card key for your Onity Lock system.